Alright guys, wrapping up this short series on Marine Diesel Exhaust Fluid (Urea) with this latest entry. The first entry was simply an overview of this sector, hit the jump next and you can read it there. Link. The second Marine DEF entry (Part II), we got into the different engine categories and their respective manufacturers, hit the jump next. Link. Now, this leads us to the last entry (Part III) of this Diesel Exhaust Fluid Marine edition. During the last 10 yers, the EPA has introduced several mandated marine emissions standards. Let’s recap that quickly to get a general time line of when this got started and where we heading with it. Tier 1- This marine tier targeted the following categories, starting in 1999 and expiring in 2006.
a) Small marine diesel engines (< 37 Kw), published October 23, 1998, 63 FR 56968. Taking effect in 1999 or 2000, depending on engine size. b) Comercial engines- Engines at or Above 30 Liters per Cylinder (published February 28, 2003, 68 FR 9746). This was voluntary through 2003; mandatory for engines m2.5 l/cyl beginning in 2004.
c) Category 3 marine diesel engines- Control of Emissions from New Marine Compression- Ignition Engines at or Above 30 Liters per Cylinder (published February 28, 2003, 68 FR 9746). Voluntary through 2003; mandatory 2004.
d) Recreational marine engines- Engines at or Above 30 Liters per Cylinder (published February 28, 2003, 68 FR 9746). Voluntary through 2003; mandatory for engines m2.5 l/cyl beginning in 2004. Tier 2- This marine tier targeted the following categories, starting in 2007 and expiring in 2011-2012.
a) Small marine diesel engines (< 37 Kw), published October 23, 1998, 63 FR 56968. Taking effect in 2004 or 2005, depending on engine size. b) Comercial engines- Engines at or Above 37 kW (published December 29, 1999, 64 FR 73300) taking effect in 2004 to 2007, depending on engine size. c) Recreational marine engines- Nonroad Large Spark-Ignition Engines, and Recreational Engines (Marine and Land-Based) (published November 8, 2002, 67 FR 68242). Taking effect in 2006 to 2009, depending on engine size. So, now that we covered the first two tiers, with latter expiring in 2011. Where are we today? Locomotives: This will apply to all diesel line- haul, passenger, and switch locomotives that operate extensively within the United States including newly manufactured locomotives and remanufactured locomotives that were originally manufactured after 1972. 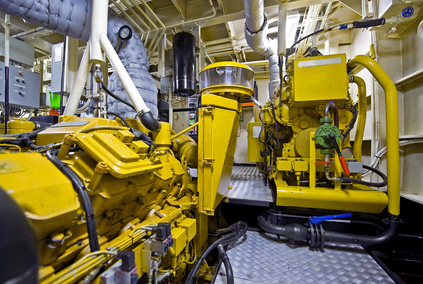 Marine Diesel Engines: This tier will apply to new manufactured marine diesel engines and remanufactured commercial marine diesel engines above 600 kilowatt (kW) or 800 horsepower (hp) with displacement less than 30 liters per cylinder installed on vessels flagged or registered in the United States. Category 1 with engines up to 7 liters per cylinder displacement. Category 2 includes engines from 7 to 30 liters per cylinder. Finally, Category 3 engines are those at or above 30 liters per cylinder. 1) These standards for existing locomotives and marine diesel engines are more stringent when they are remanufactured. 2) Second, the rule sets near-term emission standards, referred to as Tier 3 standards, for newly- built locomotive and diesel marine engines. Furthermore, the new rule will create new idle reduction requirements for new and remanufactured locomotives and establishes a new generation of clean switch locomotives, based on clean nonroad diesel engine standards. 3) The final long-term emissions standards, or Tier 4, will apply to newly-built locomotives and marine diesel engines beginning in 2014 for marine diesel engines and 2015 for locomotives. About 144 million people in the US live in areas that violate air quality standards for ground-level ozone, as of October 2007, and about 88 million people live in areas that violate air quality standards from PM. The locomotive and marine diesel emissions reductions will particularly benefit those who live, work, or recreate in and along our nation’s coastal areas, rivers, ports, and rail lines. These are the different tier standards consolidated in this latest entry. The core principle behind the evolution is to provide better efficiencies but also to provide better air qualitiy for the people working within those sectors. Folks, we are cleaning up our air and we need to continue to push forward with this in mind. Thank you for following us on this three part series. If you have any questions, feel free to call us at 281-377-5845 or email us on our contact us page. If you want to apply to be a distributor of Diesel Exhaust Fluid in the Houston Texas region, you can reach us direct by applying for distributorship on our DEF page.